Overview: Lear Capital Inc. (Lear Capital) is a precious metals brokerage, founded in 1997 by Kevin DeMeritt and based out of Los Angeles. 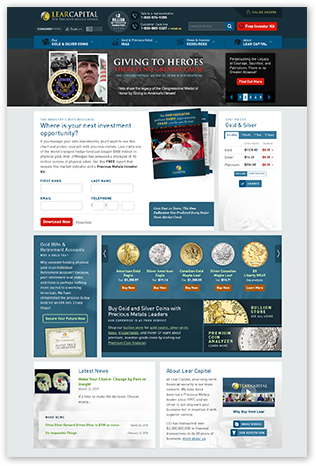 Lear Capital offers 3 main services, namely establishing precious metals IRAs for its clients, direct retail of precious metals, as well as purchasing gold and silver coins from interested retail sellers. Lear Capital charges $160 to set up a precious metals IRA, lower than the industry average of $250, and it stores its customers’ precious metals in the Brink’s Depository in Salt Lake City, Utah., which dates all the way back to 1859. The precious metals are fully insured by a comprehensive policy underwritten by Lloyds of London. At present, its customer base is primarily comprised of retail investors. Lear Capital is also a Professional Coin Grading Service authorized dealer, which enables the firm to provide its customers with coin grading accuracy and authenticity services. Lear Capital focuses on being a highly professional and transparent one-stop center for all of its prospective customers’ needs. It prides itself on its 3-step Price Advantage Guarantee in its transactions, where customers receive a Written Account Agreement, followed by a Phone Confirmation and then a Written Confirmation. Lear Capital promises that there are no hidden fees in each transaction and that its spread is clearly disclosed out to the customer. Lear Capital also guarantees delivery within 15 days or shipping fees are waived. Its consumer education section is very comprehensive, including the standard economic news blogs, as well as informational videos and articles. There is also the option of receiving free newsletters and guides as physical products via mail, if you so choose. Lear Capital also maintains an ‘Ask Scott’ section, where people are able to post questions to the CEO, Scott Carter; answered questions are posted on this section. Scott is also a prominently featured on most of the informational videos on the site. Lear Capital’s site also offers a portfolio comparison calculator, and required minimum distribution estimator to assist prospective investors in making the necessary calculations. Finally, the site also offers a premium coin analyzer tool for people to estimate the value of their own gold coins. Click to see how Lear stacks up against the best gold companies! Lear Capital’s website has a very modern look and is fairly easy to navigate. The color scheme is easy on the eyes and visitors will be able to navigate to the desired sections of the site easily using the header and footer columns. However, the front page of the site has a very crowded, in-your-face, marketing heavy look, which is unfortunately not uncommon with many modern business websites today. While the subpages of the site do not suffer from that overcrowded look, there is an insistent pop-up with a request to subscribe to their newsletter; another common but annoying feature with many modern websites today. That said, the amount of information available on the site is very high, however Lear Capital has managed to organize it in a mostly accessible manner. As their consumer education section is so extensive, it has to be spread out over the entire site, which can make for a bit of a challenge to find the exact educational section you are searching for. Overall, Lear Capital’s site, despite the overcrowded front page and an insistent pop-up, has a sleek and modern design that is aesthetically pleasing and maintains relative ease of navigation and categorization despite the high amount of information contained therein. For those looking to review Lear’s service offerings, the site does hit the mark. If you’re looking for 3rd party opinions: see direct links to Lear Capital customer reviews listed in our top companies chart. Lear maintains five main social media presences: Facebook, Google Plus, Twitter, LinkedIn, and YouTube. Lear Capital is clearly a modern corporation that knows how to market and advertise itself. This is evidenced by the rather high amount of complaints on the Better Business Bureau, and we note that out of the 36 complaints, 11 have been successfully resolved. When a company advertises and markets itself so heavily, a higher number of complaints are to be expected and prospective customers would be wise to perform the necessary due diligence before making any concrete investment decisions. That being said, overall consumer satisfaction appears satisfactory and Lear Capital’s website contains a trove of valuable information that consumers can take advantage of to educate themselves on precious metal investing, regardless if they end up going with Lear Capital or not.